Will be repeated if there are enough participants interested. Please let us know if you would like to attend. This class is available in Cornwall, Summerstown and Montreal. In this course you will learn the history and use of the Tarot. By the end of the course you will be able to do an intuitive reading for yourself or someone else. Other things we will cover are questions such as: Which deck to buy? How do I bless and cleanse the cards? Should I leave them in the box? How do I prepare the table? When I’m ready to do a reading is there anything I should do first? Please bring your own Deck. Should be a Rider-Waite Clone so including 4 suits: pentacles, swords, staffs and cups as well as the 21 Major Arcana. If you are not sure about your deck please contact us. 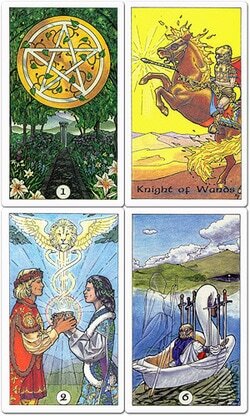 Each card is filled with many images and colours that mean specific things to each person. The key to the Tarot is to link these symbols that are imbedded within your unconscious to the cards. If you wish to make your readings much clearer you should do them in sacred space. This skill will be covered in the course. Ethics Ethics are connected to the question: Why do I want to give a Tarot reading to someone else? Are you doing this from a place of healing and helping or from a place of ego, making yourself feel superior? Ethical readings are powerful healings. This topic will be discussed in the course.